I have always taken the time to make delicious and healthy lunches for my kids to take to school and husband to work, but when it comes to lunchtime for myself I typically make something quick and easy. However, lately I am taking a closer look at my diet and making it a priority that my lunch is nutritious and healthy. I can easily get lost all morning in writing blog posts and look at the clock and it’s well past lunch time, this would be where an easy lunch snack would occur. So I have started to plan ahead and make myself some salads to have ready to eat. Chop vegetables (optional) – you can chop up all the vegetables before assembly as I have done in the pictures below, however I did this for the purpose of showing you what I add. Typically I chop as I add into the jars. ie. cube cucumber, add to jars, grate carrot, add to jars, slice tomato, add to jar etc. Here I have used Praise Deli Style Dressings, their delicious gourmet blend makes a simple salad burst with flavour, tasting just like the salads from the cafe, but made yourself at home! 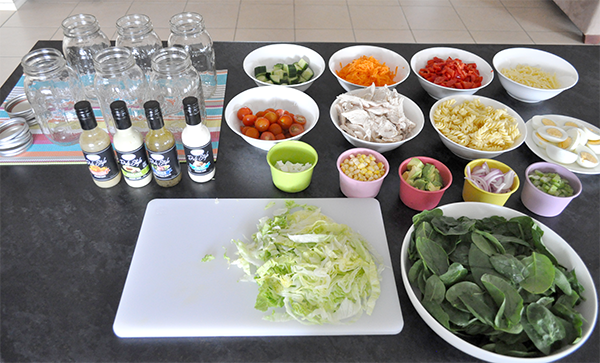 I make a few salads at once with a variety of dressings, so then each day I can have a different flavoured salad. By doing this I also use different vegetables to suit the dressing. 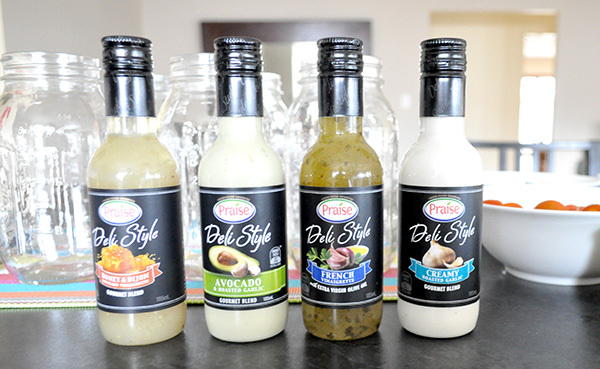 I like a creamy dressing like the Avocado & Roasted Garlic or Creamy Roasted Garlic to accompany a pasta salad and find the vinaigrettes such as ‘Honey & Dijon Mustard, French or Balsamic & Roasted Garlic dresses a typical vegetable salad nicely. All Praise Deli Style dressings contain no artificial flavours. These dressing truly make the salad so much more flavoursome. You can use what ever vegetables your heart (or taste buds) desire, just remember to follow the layer rules above. I don’t use precise measurements for the vegetables as this is really just an amount I know the family will eat. As an example though I typically put in approximately 6-8 cucumber cubes, 3 whole cherry tomatoes, 1-2 tablespoons of each hard vegetable and cheeses, 1 boiled egg and then fill the jar with salad greens. I have never had any vegetables go soggy or brown (including avocado). 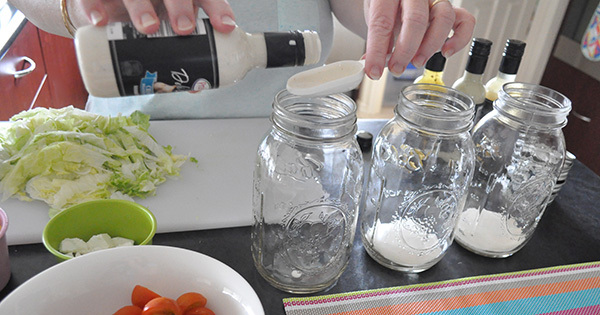 I add 1 1/2 tablespoons of dressing (you can add more if you wish) into clean mason jars. I use 1L Mason Jars, these can be easily washed in the dishwasher. You can purchase these from Big W or any cheap store. Make sure the jar you choose has a wide mouth. This size jar is perfect serving size for most, depending on your appetite you could share one jar between two. I use the 440ml jars for my salads as I like a smaller serving. Then add in the hard vegetables. Add in pasta, rice or quinoa (optional). Followed by protein of your choice. Add your salad greens, place on the lid and your finished! I can’t tell you enough how easy this was to put together and how tasty it will be when eating. You will be pleasantly satisfied and so pleased with yourself that you spent the time to pre make your lunch. When you are ready to eat you can vigorously shake the contents to distribute the dressing through out, or pour into a bowl. As the dressing is the first ingredient into the jar it’s the last ingredient out and dresses the top of your salad nicely. Tip: If you’re transporting the salad to work make sure you keep the jar upright as you want the dressing to stay at the bottom to prevent any sogginess. I make this Creamy Roasted Garlic Mason Jar Salad for my kids, they have karate training really late in the evening now, it’s too early for dinner so they usually have a salad before they go to class. This is my favourite flavour combination, I love avocado and garlic, having this drizzled over the chicken, egg and rest of the salad is so satisfying. 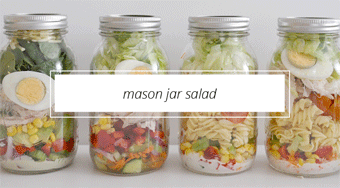 Have you tried Mason Jar Salads? What is your favourite salad combo? 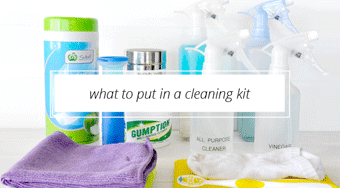 Everything is clean and sparkling! Wow these look so good I am going to have to give this a go myself, I guess you could really do whatever combination you wanted. That sounds great but am wondering does it have to be a mason jar? Can other glass jars work or even Tupperware and still remain as fresh as you say storing in mason is? Carley, Yes it can be any glass jar just not plastic as it won’t keep it’s freshness. Keeping air out is more important than glass or plastic. I have glass and plastic tupperware type containers and they keep the same. I just like the glass because the dishwasher doesn’t destroy them. Can I ask why the Mason jars? Does the jar need to be specially sealed like with preserving or can one just put the lid on the jar and the salad will be right for a few days? Such a great idea- I need to do the same thing. My husband and two children usually get fed well and I get either whatever’s left for work lunches or eat when I remember at home!! Samantha, Yes the jars need to be glass and to seal to keep in the freshness so they last. 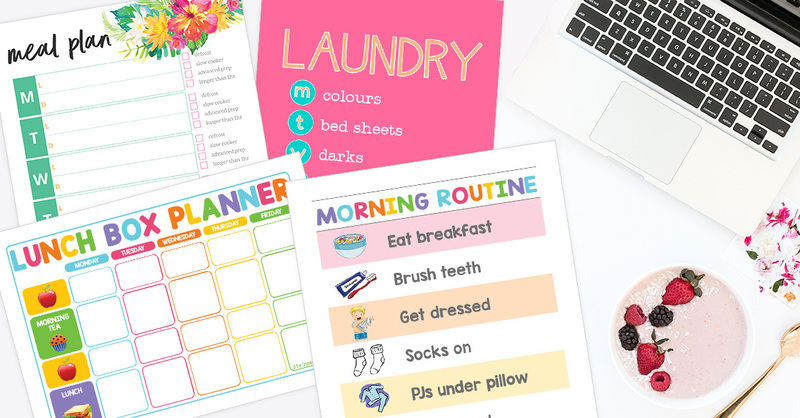 They are so perfect for busy lifestyles. 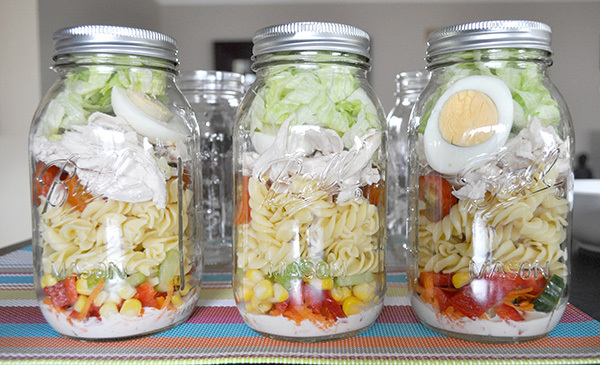 i am really Impressed with your Mason jar salads. One question – do the avocados go brown? What do the eggs taste like after a week? Thank you for such interesting ideas. Where did you find these Mason jars? All the ones I’ve looked at have a handle and a hole for a straw through the lid. 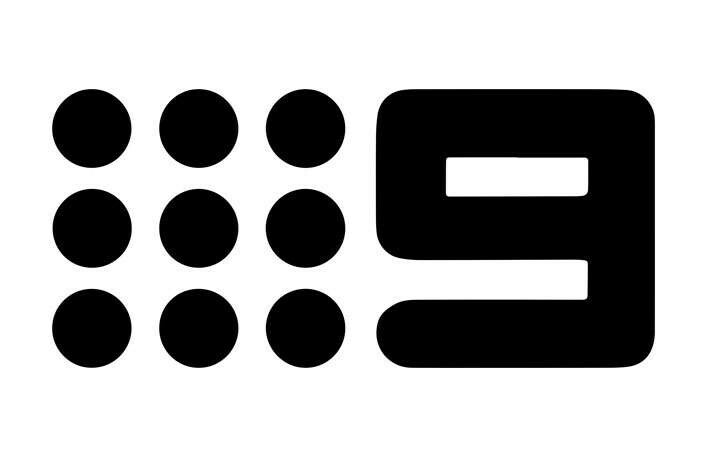 Hi Courtney, You can purchase them at Big W or there is a link on the post just above. Thanks for this post! I have been wanting to find a way to make salads last longer and was specifically considering trying a different storage container, so I will try some mason jars instead of a different plastic container! 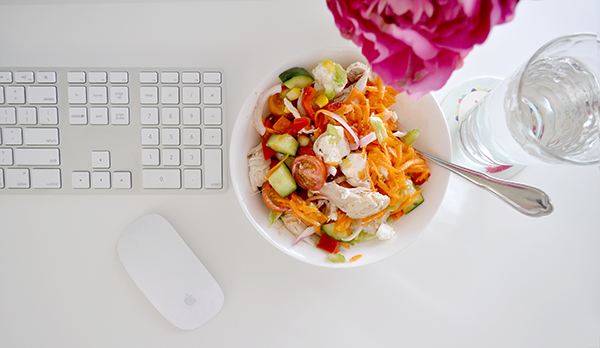 Can u layer just the dressing veggies, feta cheese and lettuce as I font like eggs or meat in my salad? Elizabeth, yes you can add whatever salads you enjoy. Mason Jars have rubber O-ring on inner lid to give airtight seal. To replicate this on coffee jars, run a thin ring of soft silicone sealant around underside edge of lid. Maccona jars also have a rubber seal so would be. Airtight but the mouth is not very wide. Did you try the maccona coffee jars? Did they work?? 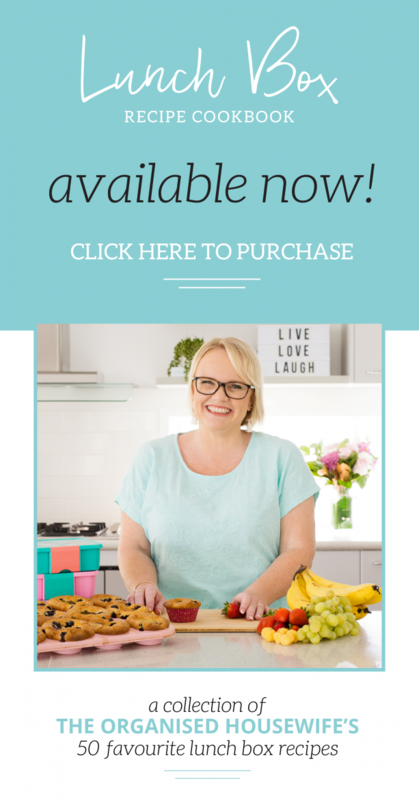 I love the idea – makung life easier! But…. What about your poached chicken – if it was poached on sunday and you made 5 salads up for mon – fri, is the chicken still ok? Sarah I am finding it is still OK, haven’t come down sick yet thank goodness. 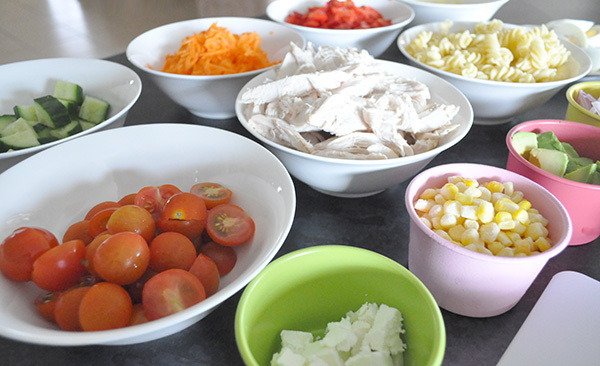 Hi regarding the chicken – you could always make the salad jars up and add enough chicken for two days if you are concerned and poach more on day three…. Poaching is very simple n doesnt take long at all. Just a thought. Or if using tinned tuna/salmon – make jars up and add tuna/salmon day before eating. Just a few options if you are worryed abiut keeping proteins for days. ? Hi, I love this idea but I’m a but unsure of how long you can wait before you eat poached chicken and boiled eggs… Is it really ok on Friday, if made on Sunday night, or is there. 2 day limit for safe eating? I completely understand your worry Tiffany I was concerned in the beginning too but it is all still edible by the Friday. My favourite is bottom layer balsamic vinegar and olive oil dressing, next layer either butter beans or chickpeas, then cous cous, then roasted pumpkin, then crumbled feta and finally a layer of salad greens ( I like baby spinach) yum! OOh Wendy my mouth is watering that sounds so so good. Yay I did butter beans last week with spinach and a bunch of other stuff – soo easy and I am glad to say I am wasting less stuff this way. I used to open a can of beans, have some, then put the remainder in a container in the fridge… and throw them out on Sunday night! 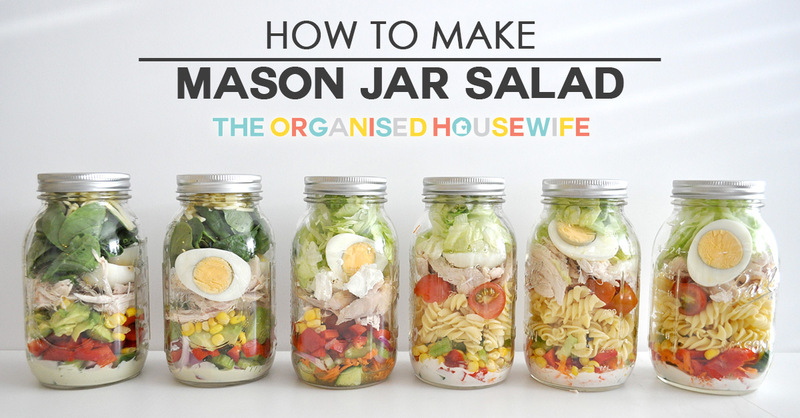 Now I am using the whole can across three or four jars of salad – it’s great! Thanks again for sharing this idea Katrina. These look amazing, I am going to experiment tomorrow. I just wondered if you thought that tuna would keep in the jar? Tuna keeps really well for up to 5 days, my salads have never lasted any longer that because They’ve been too tasty! Use Sirena Tuna, it’s the best flavour. It is in oil so when draining it use some of the oil for the dressing. I have done tuna with no problems,also I like shredded raw cabbage on top ? OOh that’s so good to hear Shell that they work, I’d love to try some with Salmon too! I’ve had a few this week with left over ham from our Christmas feast over the weekend, so good! 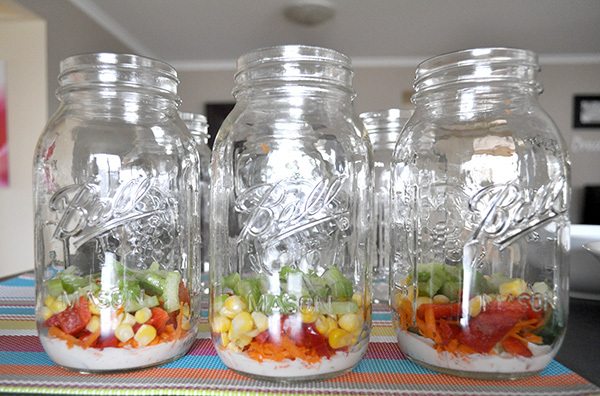 I try making your mason jar salad it was so easy to make and it tasted yummy my husband liked it too, I am also try fruit salad in the jars i put honeydew melon, rockmelon, watermelon, so we will see how it goes. I love these!!! Just wondering what you do to keep them fresh for so long? Do you just put the lid on or do you need to pressure preserve? Nothing special Ashley, just put the lid on and keep them in the fridge. 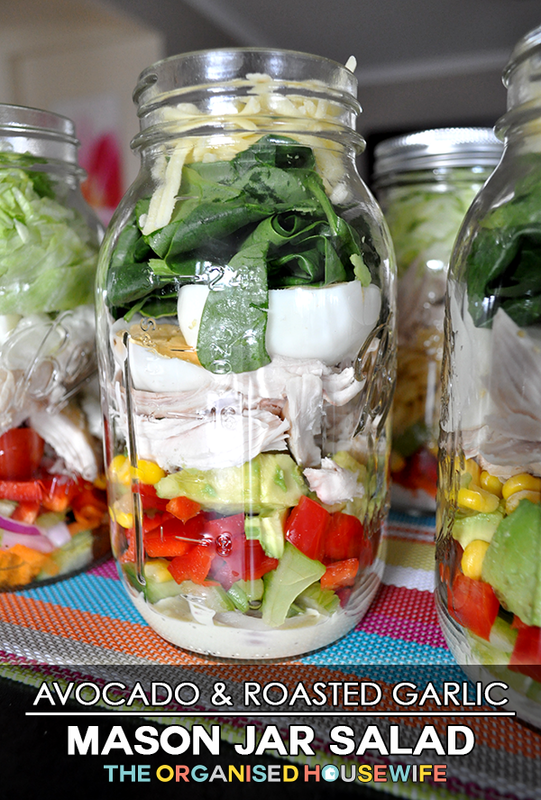 I’ve just come across Mason Jar salads they look fab! I’m on a weight loss journey and for summer, these look so awesome. Can I just ask what is a good jar size as I want to buy some. You say above you use 1lt jars but then say you use 440ml jars for your salads? 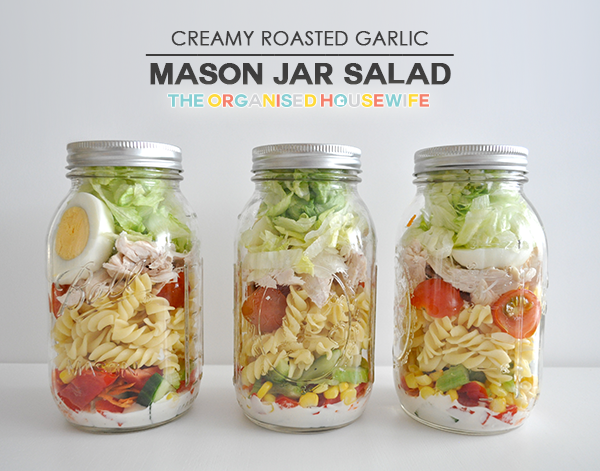 Hi Karen, Mason Jar salads are so yummy! We are loving them. Yes i use the 440ml jar and i use a bigger jar for my husband. 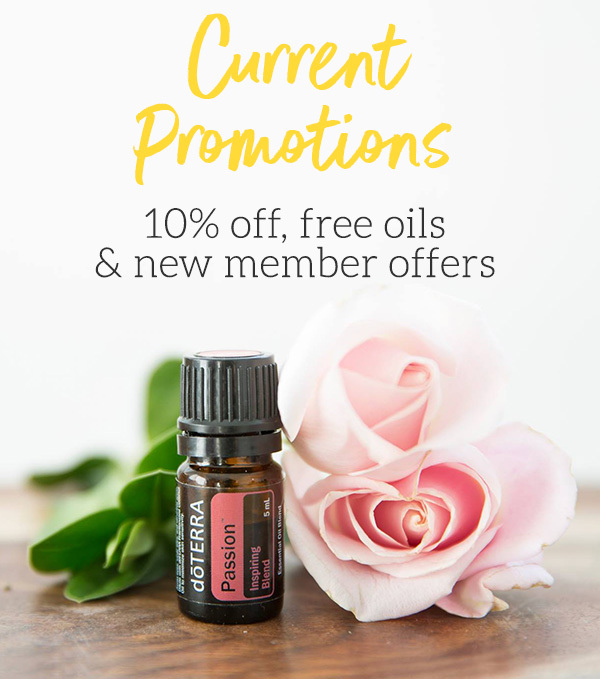 Hi Katrina – thanks for getting back to me so quickly! That’s great, thanks for clarifying that…will buy some today and get on to it…can’t wait. Love this idea, what size are the jars you are using in your photos? No not silly at all, Kellie. I personally wouldn’t use the ones with the straw in them as they have to be sealed completely and by having the straw in the the air would take the freshness out. Combine all in a screw-top jar and shake well. Layer dressing, sliced celery, spring onions, water chestnuts, slivered almonds, poached chicken, avocado, cubed mango, rocket/baby spinach/lettuce, alfalfa sprouts. Have I got the logic right? Anyone see any issues? I made my salad jars yesterday, put them in the fridge and today there is some condensation inside the jars – is this bad? Did I do something wrong?will I get sick If I eat it? 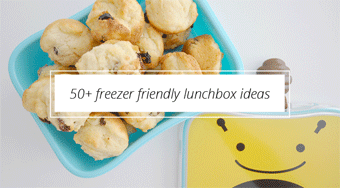 Love this idea, I always forget about my own lunch during the week and end up with cheese on SAO’s!!! Silly question but where would beetroot fit in to all the layers of this idea? Aren’t they a great idea. :) I love them for the same reason so easy to have already made ready for lunch. I would put beetroot down the bottom towards where the tomato goes. What about a pesto, pasta, chicken, pine nuts combo? Great hot or cold! I’ve seen versions with raw 2 mins. noodles, chicken and vegetables, just add hot water! Katrina you have a brilliant website with great ideas. 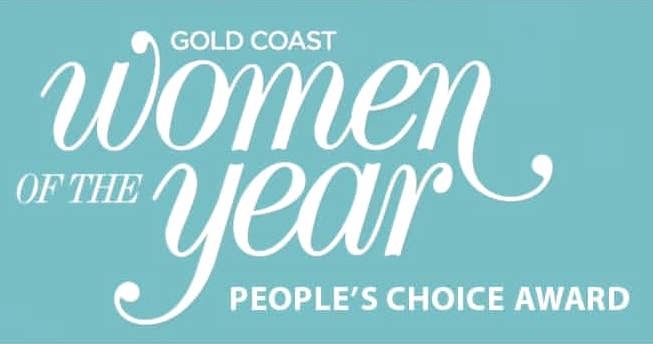 Can you tell me the best place to purchase the Mason jars, I live in Penrith NSW. Hope you can help & thanks in advance. Can you tell me what size Mason Jar to use as I’d like to order the same as the pics but can’t find them online. Also can you tell lmd where to purchase the Mason Jars from thanks, Helen. Love it! These salads would be great for picnics as they could travel in an eski with drinks. 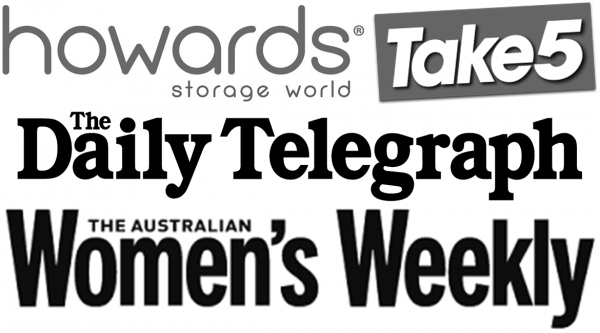 I’ve been trying to buy your recommended jars both in bigw and from your online link. Raw foods store is closed till March! Any other links where I can buy them? They have really cheap good quality jars. 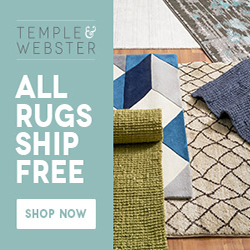 Plus they ship out really quick and at reasonable prices. did anyone try the Moconna jars yet?? I also have heaps in different sizes, I’ll try it this week and report back. Well, big success with the Maconna jars! Made them up on Tues and ate them Saturday. Used homemade mayo and layered carrot, cucumber, corn, capsicum, tomato, risoni, ham, egg, spinach, lettuce and snowpea shoots. Was fresh and crunchy as if I’d made it that day. Sold! I lovvveeee these ideas Katrina your site is the best thats online Thankyou so much. I experimented on the mason jar salads and wow i can’t believe how fresh they stay in them for a period of time. For food and safety reasons Id eat the ones with whole protein in them first. Cheese can last longer. Sue your salad looks so delicious going to try that next!! Hi! can’t wait to try these this weekend! just wondering if anyone has tried beetroot? does it make everything soggy and purple? thanks ???? Hey Courtney, I use beetroot in mine, but I use it raw for that extra crunch. It turns my dijonaise a nice pink colour but that’s it. Would be interested to know how cooked goes. Love this post! I use mason jars for just about everything! If you are looking for some I find ozfarmer.com very good and more importantly very cheap 🙂 Going back to read another post! 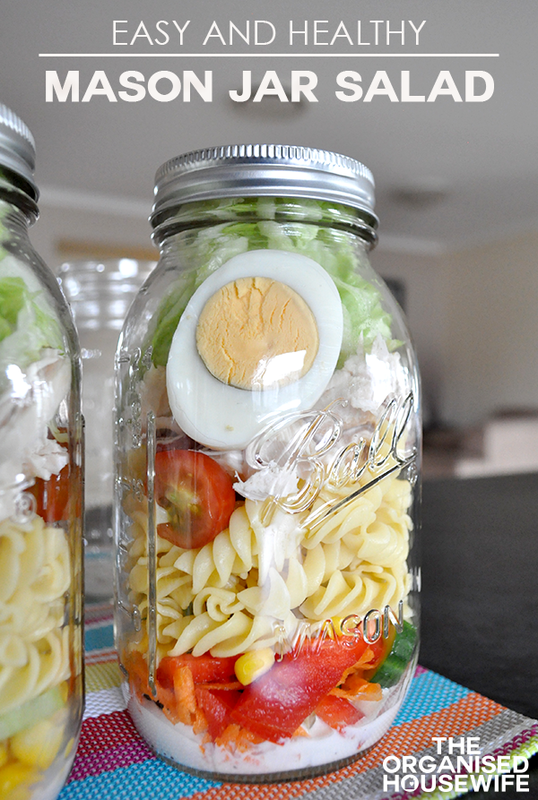 I made the salad in a jar…..fantastic!!! Yum, tuna is delcious in these as well! You’ll be surprised in a few days time it’s still just as crunchy!! you have me thinking now… could they also be used as a concept for a stirfry…( minus the meat… just add later.. for a quick meal. My mr 11 loves salads for school lunch. Usually I make the salad up in a lunchbox and then have little containers of dressing and cheese for him to add at school. 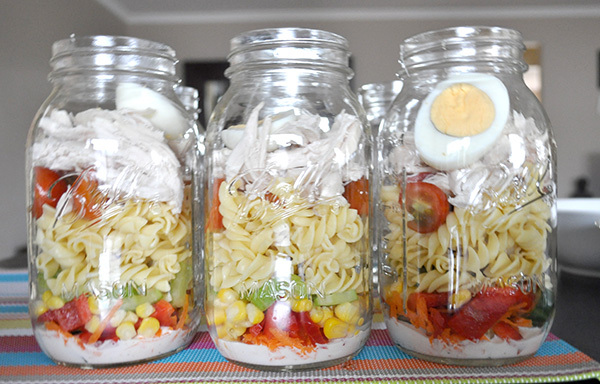 The mason jar idea sounds easier for school mornings, but obviously a glass jar at school is not feasible. Do you have any suggestions? 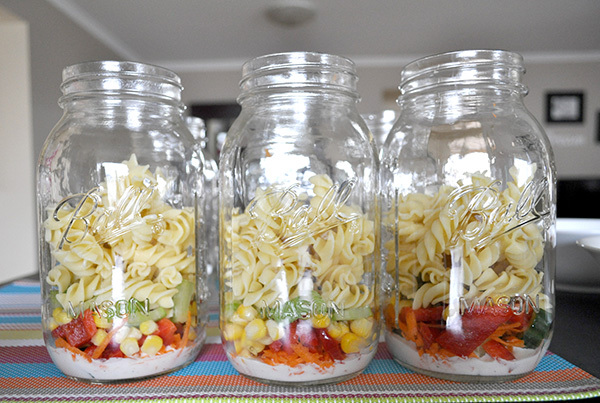 Hi Darra, I would say make the mason jar salads in glass jars, then in the morning pour them from the glass jars into a plastic lunchbox to be safter for school. Can you use ham, Turkey etc? absolutely, even tinned tuna or salmon would work too. Hi, bit late to the party with the Mason jar salad but am wondering if adding tomato does it make salad go soggy or do you remove the seeds? One of my favourite salads is the BLT pasta salad. Dressing is sour cream, mayo & whole grain mustard. 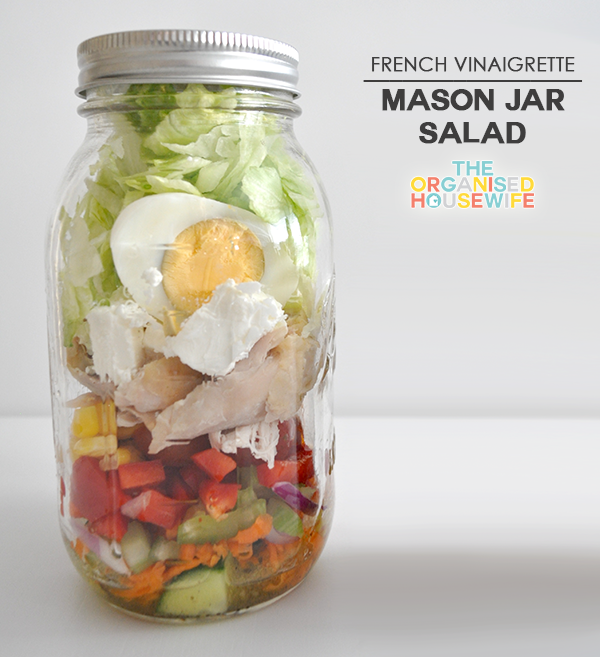 I’ve never made a mason jar salad before but I know what I will be making once I buy some! ooh that sounds delicious!! thank you for sharing!